I purchased these beautiful items many years ago at an Indiana estate sale! 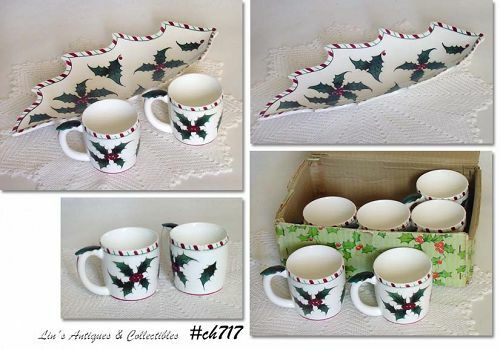 There are 3 pieces in this set – 2 candle holders and a small trinket tray. All show Banbury Cross and St. Mary’s Church and were made in Germany. The candle holders measure 4” tall and 3” diameter (at base). 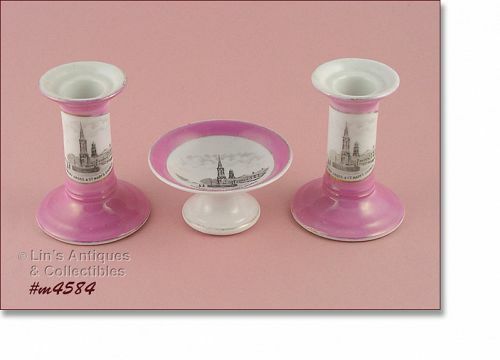 The trinket holder/tray measures 2” tall, 3 5/8” diameter (top), and the pedestal type base is 2” diameter (at bottom). All 3 pieces are in excellent condition. Very nice items, very collectible! 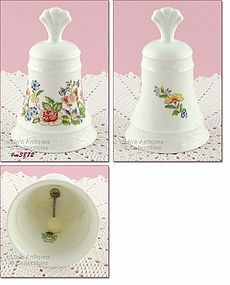 This is another beautiful bell from Danbury Mint’s “Bells of the World’s Great Porcelain Houses”! This one doesn’t have the Certificate of Authenticity but the inside of the bell has “Bone China, Hammersley, Made in England” and it is in the original shipping box. Bell is absolutely gorgeous – a great gift of addition to a collection! 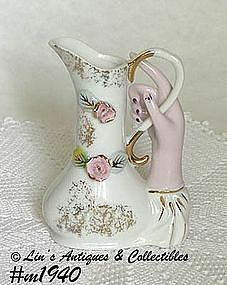 This is a beautiful bell produced by Aynsley China of Longton, Staffordshire, England! The bell is from “Bells of the World’s Great Porcelain Houses” and was designed and produced exclusively for The Danbury Mint. Bell is in the original shipping box along with the Certificate of Authenticity is included as well as the original purchase receipt dated 1/27/84. This is an excellent addition to a bell or an Aynsley China collection! 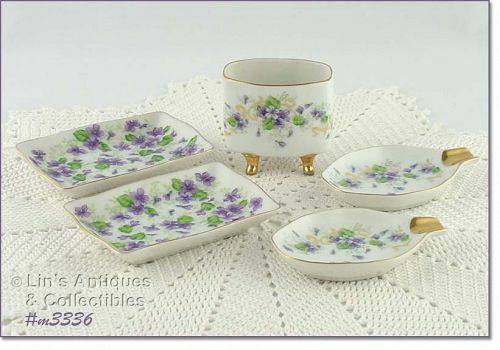 For a number of years, these pretty Lefton items have been a part of my small collection of “violet” items! Set consists of a cigarette holder, 2 ashtrays, and 2 small rectangular shaped trays. Each piece has the original Lefton red and gold label/sticker. 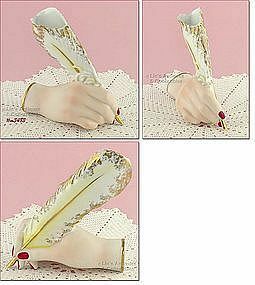 Excellent condition – ladies smoke sets are becoming difficult to find! 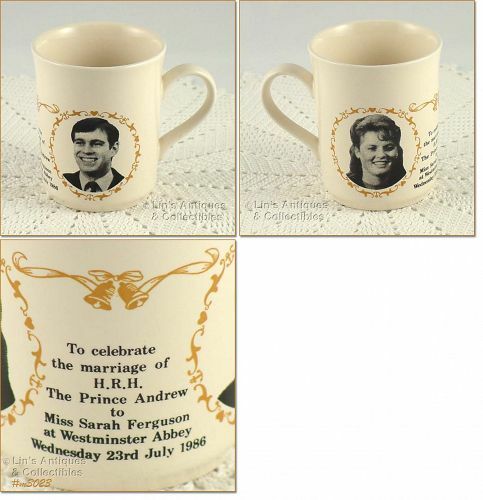 This is a pretty item – a 25th wedding anniversary candle holder made by Lefton! Back is marked: Lefton China, Hand Painted, 6940 (and has crown trademark). Candle holder is in wonderful condition with minor wear to some of the silver – that’s it! 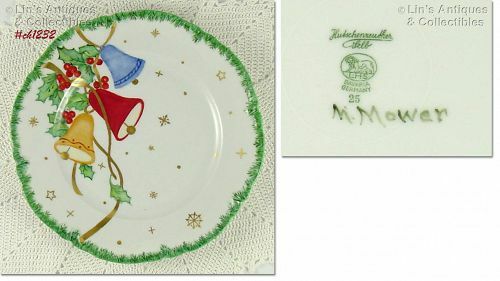 This listing has an absolutely beautiful vintage Hutschenreuther Christmas plate! It is perfect to hold cookies for Santa! 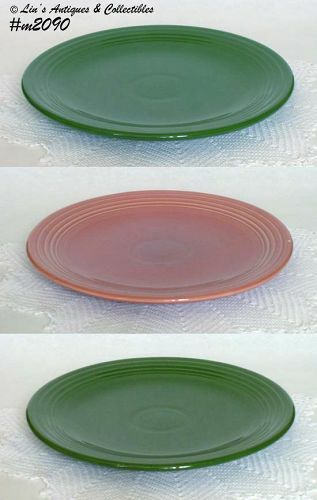 Plate is hand-painted and is in excellent condition. Back is marked: Hutschenreuther, Selb, Bavaria, Germany, 25. It has the lion and circle trademark and also the initials LHS. This is an outstanding children’s alphabet bowl! 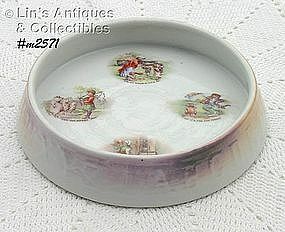 It has the alphabet around the outside of the bowl and the inside has 4 nursery rhyme scenes. The bowl is 7 3/8” diameter, 1 1/8” tall, and bottom is stamped “Germany, 226”. It’s in wonderful condition with some wear to some of the nursery rhyme titles – that’s it! Super collectible. 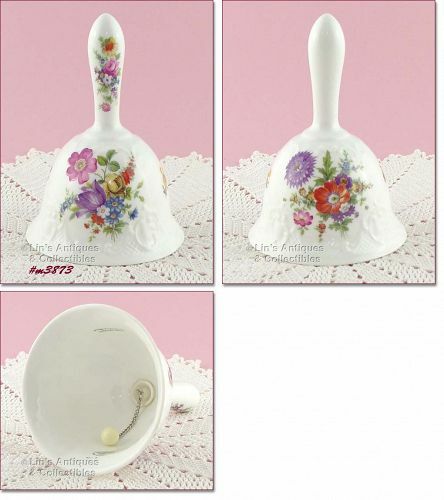 This is a pretty Lefton bud vase! 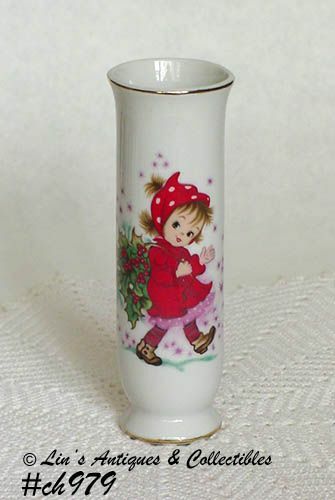 The design is “Christmas Christy”, vase measures 6 3/8” tall, has the Lefton foil sticker, and is marked on bottom: Lefton China, Hand painted, 438P. Vase is in excellent condition! Cute item, not your every day find. Several years ago, I began a small collection of “hand” vases – this vase is from that collection and I will be listing others in the future. Vase measures 5 1/8” tall (at tallest) and is in excellent condition – there is some wear to the color on her fingernails – that’s it! Bottom has the original silver with burgundy foil sticker that shows a covered wagon, a crossed sword and gun, the letters P (at top), D (at bottom), and Japan. Lovely item that caught my eye! Beautiful tea for two teapot with matching sugar and creamer! 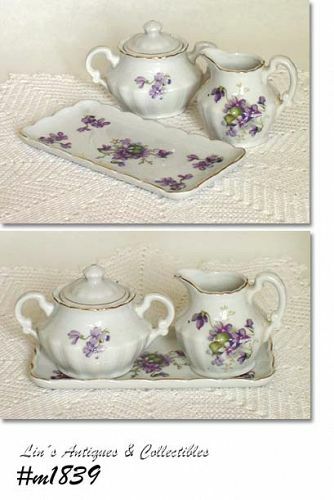 Set was made by Kingwood China Company, has lots of gold trim, and lovely purple violets on both sides. Teapot measures 5 ¼” (to top of lid), sugar is 3 ¼” (to top of lid), and creamer is 2 ¾” (at tallest). 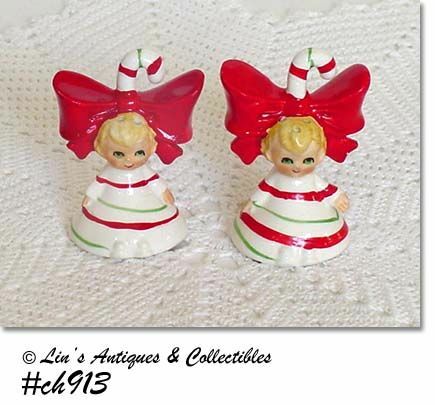 Lovely pair of Lefton Christmas candle holders in this listing! 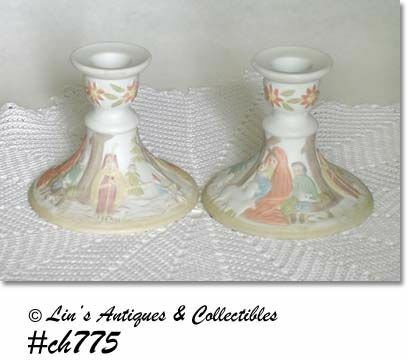 They measure 3 ¾” tall, candle holders are white with softly colored nativity scene on each one. 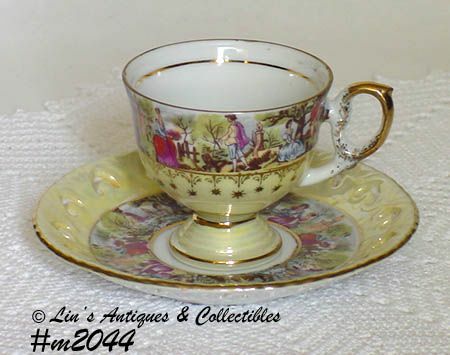 Marked on bottoms: The Christopher Collection, Lefton China, Hand Painted, 03430, 1982, Geo. Z. Lefton. They also have the Lefton red and gold foil stickers on bottoms. Excellent condition – always pampered! 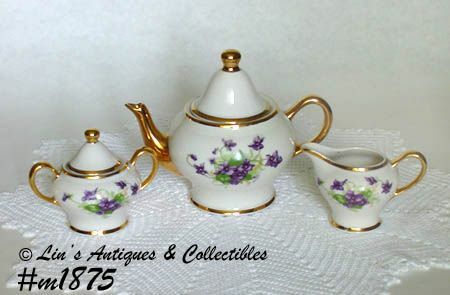 Lovely wild violets pattern on this creamer and sugar set! Creamer measures 2 5/8” tall (at tallest), covered sugar is 2 5/8” tall (at tallest), tray measures 8 ½” x 3 ¼” and all pieces are in excellent condition. They are not marked but could be Lefton.